Sonakshi Sinha tweeted, "Don't be silly, Sonam Kapoor. We've all been on these shows where we are coaxed to say things we really don't want to"
Sonakshi Sinha had said, "Sonam Kapoor once showed her a lot of attitude"
Olive branches have been extended on Twitter between Sonakshi Sinha and Sonam Kapoor after the first actress apparently revealed on a show that the second had given her 'a lot of attitude.' Sonakshi has now posted a message - in which she explains her comment away as being 'coaxed to say things we really don't want to' - in response to Sonam's 'sorry' tweet which went viral over the weekend. Equilibrium appears to have been restored although there's no knowing how actress Neha Dhupia, host of the show Sonakshi made the comment on - will receive the suggestion that her guest was 'coaxed' into making a confession she didn't mean. What Sonakshi Sinha said on a taping of Vogue BFFs with designer Manish Malhotra as her co-guest was that Sonam once showed her 'a lot of attitude, which... was unnecessary.' Sonam tweeted a link to an article that reported the quote, writing: "Sona, I've always been warm towards you. Don't remember showing you attitude! If you feel that way I'm sorry!" Sonakshi's response: "Sonam Kapoor, don't be silly. We've all been on these shows where we are coaxed to say things we really don't want to. And then aren't we used to things being blown out of proportion? Not to be taken seriously! Big hug." 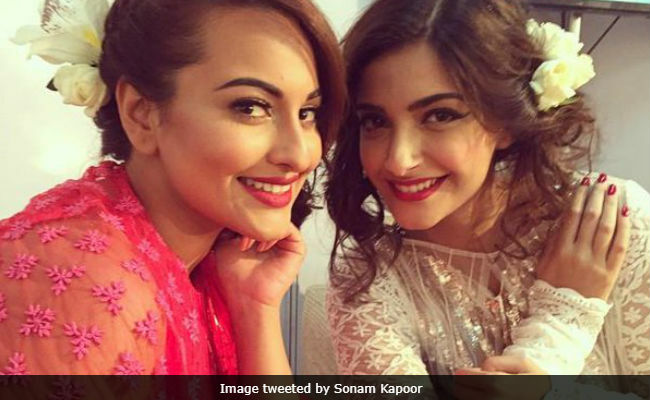 Read Sonakshi and Sonam's Twitter exchange here. What an explanation, sonam u r way above this showoff. Love u. And @sonakshisinha nobody can coax someone to say such mean things about others, it was ur insecurity talkin. And pls dont sing, even in auto tuning, u sound terrible. this called hypocrisy. why you said things that is not true about someone. Manish Malhotra, an unwitting participant on the sidelines, was thanked by Sonam in her tweet for saying these nice things on the show about her: "I think she is a real fashionista, and she is fabulous but I think Sonam has a lot more talent. She should definitely work a lot more. I mean she should do more films," news agency IANS reports. Sonam Kapoor stars in last week's major release PadMan, co-starring Akshay Kumar and Radhika Apte. The film has earned Rs 23 crore so far. The film is based on Arunachalam Muruganantham, who invented a low-cost sanitary pad making machine. PadMan is produced by Twinkle Khanna and is directed by R Balki. Sonakshi Sinha was seen last year in Noor and Ittefaq and has Welcome To New York lined up for release.